Aren’t you tired of throwing away your hard-earned money? “WHAT HOW DARE YOU SIR.” – You, upset that I would make such an obnoxious assumption. If you’re a web designer, and you’re letting your satisfied clients walk out the door with their shiny new website, never to be heard from again, you’re tossing cash in the trash. And the worst part is, it’s the most valuable type of income of all. Ok, time to wipe that drool off your keyboard and pay attention. Building a website is merely the first step to building a killer online presence. The real work takes place afterwords. And for some reason, many web designers are choosing not to get involved in this valuable work. Why they make that choice is beyond me. But I’m here to (hopefully) change their mind. 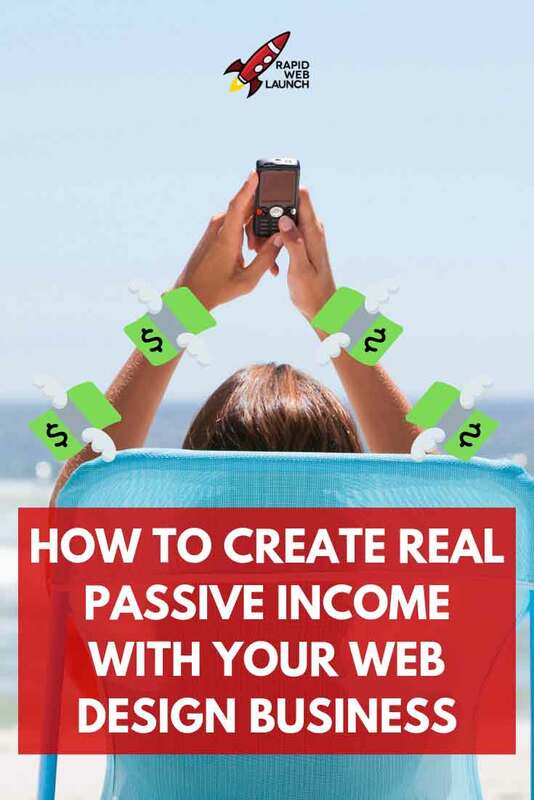 Making real passive income with your web design business is possible. You don’t have to use shady business tactics or cheap sales gimmicks to get it either. And your web design clients will get a ton of value from it. It is a true win for everyone involved. To be clear, most of these options are not 100% passive. But they’re like, a solid 90% passive. Everything requires at least a little bit of work to maintain. Think more along the lines of the 4-Hour Work Week rather than complete retirement. You know what every single person who owns and runs a website needs? Website hosting. When you’re done building that gorgeous new website for your client, why should you pass them off to some other web hosting company to steal your hard-earned income? Keep your client in-house and give them the superb-quality website hosting they deserve. Don’t worry. This doesn’t mean that you have to go and build your own network of servers. You can lease them from a hosting company that has already done the heavy-lifting. Your job will be to manage and maintain your clients’ websites on those leased servers. For many of you, this will be a bit over your head. It is for me too sometimes, believe me. I’m a web designer, not an IT tech. Which is why I pay an actual IT tech to manage this aspect of my business for me. Stick to your strengths, and hire someone else to stick to there’s. If you don’t have the funds to hire someone yet, you can always lease your servers with a company like BigScoots, who will often take care of much of the annoying tech stuff for you. Decide what features you’d like to include in your hosting plans. Choose the pricing for your hosting plans. Sell your hosting plans to each client you build a website for. Bask in your passive income profits. If all of that sounds a bit overwhelming, and you’d rather keep things simple, you can always resell web hosting services on behalf of another web hosting company. This will get you a smaller piece of the pie, but will definitely be more hands-off. Just be sure to partner up with a web host that will give you a share of the monthly residual income, rather than just the upfront referral that companies like Bluehost offer. Remember, we’re going after that monthly passive income here! And reselling web hosting is actually the only one of these income options that is 100% passive. Sign up as an affiliate with a quality, reliable hosting service that your clients will love. Refer your clients to one of these hosts when the website is ready to be published. Enjoy your truly 100% passive income. If you’re a super-techy fellow who knows their way around a server rack, this could be the best option for you. Leasing a dedicated server will be much more costly initially, as you will be taking on the responsibility of managing a whole server by yourself at a flat monthly rate. But, as you acquire more hosting customers over time, your profit margins will dramatically increase because you won’t have to pay extra to host each additional site. You’ll also be able to provide a higher quality hosting service, since your server will be 100% dedicated to your clients only. You won’t have to split any of its resources with other websites not owned and managed by you. Keep in mind that this is definitely the least passive of the passive income options here. Server management can be a pain in the rear even if you know what you’re doing, and a complete disaster if you don’t. You may want to seriously consider hiring a System Administrator off of UpWork at an hourly rate. You typically won’t spend more than $50/month with the occasional issues that pop up. Decide what features you’d like to include in your super-hosting plans. Choose the pricing for your super-hosting plans. Sell your super-hosting plans to each client you build a website for. Try to acquire your first few hosting clients ASAP so as to alleviate the high upfront cost of leasing the server. Watch your passive income profit margins sore with each new web hosting client you acquire. Why stop at offering web hosting? The #2 most common problem website owners encounter is maintaining their shiny new website once it’s up and running. Being able to easily make small edits and changes themselves is one thing, but staying on top of performance, optimization, plugins and updates is a pain in the rear. Most people would much rather pay someone a modest monthly fee so they never have to worry about that stuff. That person should be you. Mind you, this isn’t always as passive as you’d like it to be. If a client is constantly harassing you to make minor changes here and there, they will quickly wear out their welcome and that modest monthly fee will start to look like pennies to you. This is why you need to choose your clients wisely. But these trouble clients are definitely in the minority. Out of the hundreds of clients I’ve had over the years, I’ve only had to fire less than 10. Just be sure to price your maintenance services correctly! We’re building passive income, not passive debt and anxiety. Figure out what features and services your website maintenance package will include and, just as importantly, not include. Choose the pricing for your monthly website maintenance package. Sell your website maintenance services to each client you build a website for. Gaze upon that sweet, sweet monthly retainer income on the 1st of each month. What else does every website owner need? And every person on earth, for that matter? Email hosting is a bit dicier than web hosting. There are far more things that can go wrong with email hosting. Not to mention the myriads of laws and regulations surrounding keeping your clients’ privacy safe and emails secure. If you don’t do this right, you could be opening yourself up to some nasty lawsuits. Or have you not heard that internet-connected computers get attacked by hackers every 39 seconds? Honestly, even considering the massive profit margins of email hosting, I don’t feel it’s worth it. You’re better off doubling down on the other passive income revenue streams mentioned here. Or, do something simple and resell another, more reliable email hosting service. But… it is a viable passive income option for web designers. So it would be wrong of me to exclude it from the list entirely. Option 1 is to merely resell email hosting services through a popular provider, like GoDaddy. This is by far the simplest option, and the one I recommend if you’re gonna dip into email hosting. Sell your email hosting services to each client you build a website for. You know what my clients always ask me once their website is published? Ok, maybe not so much that 2nd part. But the first part? Yah, always. If you know how to build websites well enough to sell them to people, you sure as heck better know the fundamentals of great SEO. You don’t need to be an expert, but you do need to know enough to set your clients’ websites up for success. Things like keyword research, meta tags, descriptions and image optimization should be a normal part of your vocabulary. But, the thing is… that stuff should all be done as a part of building a new website. And we’re talking about building ongoing passive income here. Sell your SEO/content marketing services to each client you build a website for. There are so many supplementary services web designers can be offering, but most designers just let their clients walk away as soon as they’re done building the website. And a good chunk of them are as close to passive income as you can get! Between hosting, reselling hosting, website maintenance, email hosting, SEO and content marketing, you have a vast array of opportunities to rapidly grow your web design business. And these are just the passive income opportunities. I haven’t even touched on the other additional services you can offer as a web designer. Don’t box yourself in. Look for ways to expand your service offerings, and meet the needs of your clients in every way possible. Because I’ll tell ya, it is extremely satisfying to sit on a beach in Ecuador knowing your bank account is continuously filling up with cold hard cash. Or spending your time volunteering to help people without having to worry about how you’re going to pay the bills at the end of the month. These things are achievable with a very modest source of passive income. And your web design business is the perfect place to find it. Great to read your article!!! for me, it’s worth sharing.